We weren’t even looking for a dog at the time. My partner, Dean, and I had just moved into a new apartment, and we had decided that having a dog would have to wait until we had a house. Maggie changed everything. I work with special-needs children, and I was volunteering at an Ontario animal shelter with a client when a short, stocky, black and white dog crawled into my lap and sighed. I fell in love and seven days later she came home with us. We adopted Maggie as a Boxer cross, and we will forever be thankful to the wonderful person who classified her as such, as they probably saved her life. It was immediately clear to us that she isn’t a Boxer cross, and after some research and our first vet trip, we figured out that she is a pit bull type cross. Our vet met her and immediately said “Oh, what a beautiful pit bull cross!” That kind of opened our eyes! Luckily neither of us has ever believed in stereotyping dog breeds, but we also knew that we had to do some research. 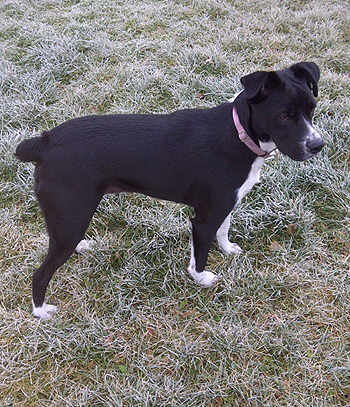 Maggie is a short, stubby black and white dog with a docked tail. It was clear to us from the start that she had been horribly abused – she was and is terrified of everything. She spent the first week in our apartment checking on us every 30 minutes because she was so scared that we’d leave her. Maggie was found on a highway, still lactating from recently having had puppies. She was less than 1 year old. We soon found out that she has some unique fears; she is even afraid of other dogs and seems to assume they will attack her. By watching her behavior and doing hours of research, we have begun to wonder if she was used as a submissive to train other dogs to fight. The sad thing is that dog fighting is present in rural communities in Ontario, specifically in the Amish and Mennonite areas where we live. Maggie does like certain other dogs, especially gentle females. This led us to consider another dog. 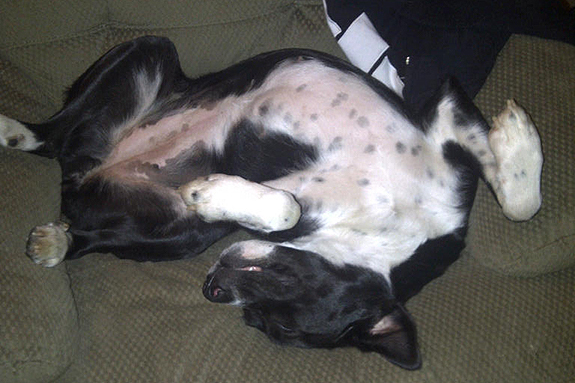 We found the organization Ugly Mutts in Toronto, and soon we adopted Molly through them. She is a red American Bulldog/Border Collie cross. They are an amazing organization, and they saved Molly off death row in an Ohio shelter. Molly is a friendly little girl who just turned 1 year old at the same time Maggie turned 2. Maggie has become so much less anxious having her around, and they are best friends. 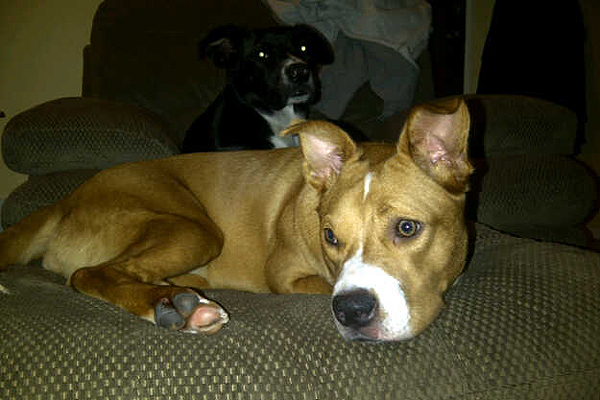 While neither Molly nor Maggie is a pure pit bull, they both are classified as pit bull type dogs under the Ontario ban. We have had some horrible experiences with people because of the ban here, as almost no one has had any experience with pit bulls other than media stories. We have repeatedly been told to have our dogs put down because of their appearances. Our dog Molly was falsely accused of an attack at a dog park, and we received a full muzzle and leash order. Maggie was even kicked in the head by a man whose dog had attacked her! We have unfortunately had to become creative to get these dogs treated the way they deserve! However, there are tons of positives. We have lots of people who love our dogs and have told us they never agreed with the ban. All the people in our apartment building love them and greet them by name, even though they don’t know Dean and me by name! We love the qualities of these dogs; they are loving and friendly, gentle but playful, and they always have energy to go anywhere. They are the perfect companion dogs, and we fully believe that they will make wonderful family dogs when we have children. We do hours of training each week with our girls, trying to make them the perfect pit bull ambassadors! They are wonderfully smart and are great learners. As someone who grew up in a (non-conservative) Mennonite community in the U.S. and who has Amish relatives, the prevalence of dog-fighting and puppy mill breeding in the Amish and conservative Mennonite communities upsets me a lot. I’m normally quite proud of being culturally Mennonite (even if I now identify as an apathetic agnostic), but this is one time when I’d be just as happy to have nothing to do with that part of my identity. Who kicks a dog in the head?! I really hate human beings sometimes. Thank you for being an ambassador for the breed! @annedreshfield Those pups look mighty happy don’t they Anne? thanks for commenting. @annedreshfield “Who kicks a dog in the head?” Answer: People, thus the futility of blaming the dogs. We have a people problem, NOT a dog problem. The good news? 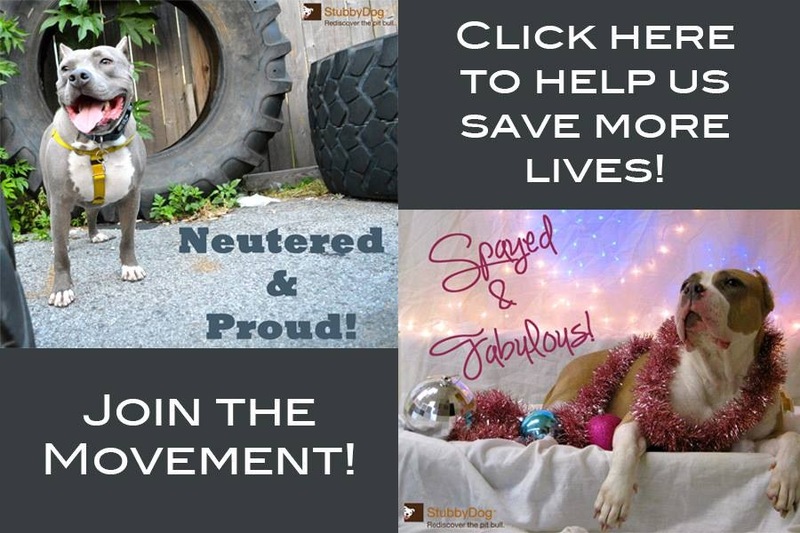 Sites like StubbyDog & people like Andrea are changing things for the better! Together, we can make society better for everyone, two legs and four. Thanks so much everyone who has responded (I’m Andrea who owns Maggie and Molly), I appreciate your support. It is so nice to know that others out there are as fond of this breed/type as I am. Since writing this article my partner and I separated and the dogs are living with me. This week while interviewing dogsitters I actually had a girl yell at me that my dogs looked mean and that she couldn’t believe I wanted her to dogsit a pitbull. I laughed at her. These dogs are wonderful and I owe them my life. Your girls seem like real blessings. They are blessed to have you too. Have you found a dogsitter yet? Your dogs are lovely, and they’re very lucky to have found you. However, it is important to remember that just because a dog’s past is unknown and they suffer from anxieties or fear does not necessarily mean that they were abused or used for dog fighting. To make these assumptions is to continue to stereotype pit bull type dogs. So, while it is possible that skittish, fearful or scarred dogs have had a rough past, it’s also just as likely that they are anxious, have had bad encounters with people or dogs, or got tangled up with a fence.